SNK Heroines is a casual fighting game starring only ladies from the rich SNK roster. Well, except for the one guy that was turned into a female for this game. And the boss. And the guest characters. Anyway, Terry Bogard sells games, so he's now a female, and all of them must battle each other to escape the crazy dream world made by the one guy in the game. At first glance, the game looks a lot like a King of Fighters. It has a familiar roster, the boisterous announcer, and is 2-D. You even have a tag partner, hence the game's subtitle. Once you spend some time with the game, it probably has more in common with Super Smash Bros., or Playstation All-Stars Battle Royale (still a bad title). It's not just the items, the simplified moveset, or the super finishes, but a combination of all of them that make it feel that way. Make no mistake: this is a simplified, watered-down fighter. That's not necessarily a bad thing, but be aware of that before jumping in. There is a light attack button, a heavy attack button, a special attack button, and a throw button. Block is also a button, which is not usually the best choice in fighting games. At least super moves get their own button too. While that sounds like a lot, the moves are very limited. You can't even duck! Combo potential is basically a few lights, a heavy or special, and then trying to tag and chain a few more hits. Since I'm not great at fighting games, there may be more, but I don't think so. Like Smash Bros., tilting the stick in a direction with a button press changes some moves, notably the specials. While this could add some depth and ease of use, it just felt too limiting to me. Especially since some of the light or heavy normal attacks were just bad. When a character has about six standard attacks, one of them can't be useless. It just doesn't work. Even worse, multiple characters have these, and sometimes they are the combo opener. I've hit with an attack, and the enemy recovers before I do and hits me back. How is that balanced? Special moves and the "dream finishers" (super attacks) take meter to preform. In a strange move, the life meter and special meter are on the same bar. The cool part is your special cap extends as you take damage, but the bad part is that it's just not a good decision. It's just too weird for people that have played a fighting game before. And while you might think that this game is made for them, there are plenty of references to things that only fans would know. 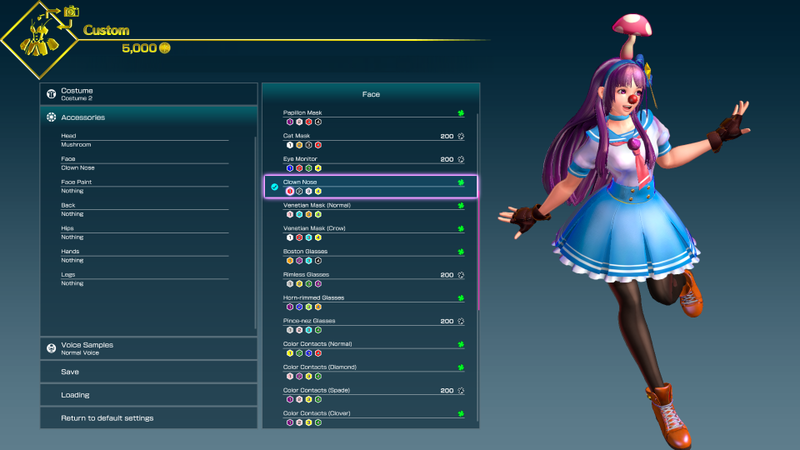 It's not something that is easily pulled off, and SNK Heroines doesn't. Depleting a character's health is not the end of the fight. Instead, you have to actually hit your opponent with a dream finish when their health is red. One one hand, this should be cool, as it ensures the fights have flashing outcomes. In practice, it's more like Playstation All-Stars Battle Royale: not that exciting. The super moves themselves can be cool, as maybe a small handful actually are, but most times they just fall flat. Instead of a flashy finish, the screen quickly fades out when you hit with the move. They just peter out, and lack impact. They don't feel like a strong move that ends the fight, they just feel limp and weak. This in exacerbated by the hit sparks/hit effects. A lot of special and super attacks send out a plethora of stickers, teddy bears, and rainbows and stuff that just feels goofy. Did Lisa Frank design this stuff? Besides being too large and out-of-place, it feels lazy and stereotypical. SNK Heroines also has a story mode. It is more involved than I thought it would be, but it's still barely more than an excuse to make the game. Kukri traps the women in this magical world made from his mind, and makes them fight. He somehow steals the despair from the losers, and that will make this world permanent. Yeah, ok, super plausible. The cutscenes in story mode can be utterly bizarre, but they can also be funny. The character interactions and endings are enjoyable too. So strangely enough, it ends up being probably the best part of the game. Besides the story mode, there is the obligatory (at this point) Versus and Online modes. What you might not expect is the amount of unlockable things, including costume pieces. Since the playable character are all females (technically, here Terry is as well), you have to dress them up. Each heroine has two purchasable costumes, the first of which is their more traditional/normal one. The third costume is a bit of a mixed bag. Some are really nice, and I like them, while others feel very random. What I really would have preferred is getting some costumes on other characters...think of the possibilities! Then come the accessories. There are a plethora of options of baubles and doo-dads that you can put on heads, hands, feet, etc. Some are already unlocked, and some must be purchased. You can even remove pre-set ones, and make Sylvie look not terrible. In the vein of Senran Kagura, there are unlockable backgrounds and poses you can put the characters in. Most are from the ending scenes. Once you set it up, you can take a picture of them. I'm sure someone will love that feature, but it's not really one I would get much use out of. 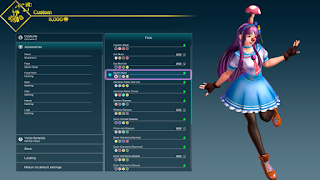 On one hand, SNK Heroines ~Tag Team Frenzy~ is a party-type fighter, easy to pick up and play. On the other, I think it's a bit too simple at times. I might sound pretty negative about it, but the story can be pretty fun, and it doesn't take it self too seriously. I doubt there will be high level competitions of the game, but that's not what it is meant for. It's a decent thing to play with a group of friends that don't really play fighting games, although they aren't going to get much out of it. I think there should be a few tweaks to make it better for the audience that would appreciate it. Simplistic fighter that's easy to pick up and play. Feels a bit content-light, and the core of the game is niche enough to potentially alienate the casual audience that could easily grasp the mechanics. While I think female Terry Bogard is a fun idea, there are a lot of female characters not included, but probably should have been.